Fifteen months of work ~ all 12 blocks for CQJP 2015 are complete at long last! What a journey this has been! I've learned so much along the way and these blocks have taken me places where I never dreamed I'd go! This block had it's challenges. Being last and making it coordinate with all the others was certainly one of the big ones. Another challenge was the "U" of light colors that dominate the left and lower part of the block. The orientation of the block with more vertical lines also gave this block a creative puzzle. But overall, I'm happy with how it turned out and it balances wonderfully with the other blocks! One last time... the rick-rack was the first part of the block to be worked. A simple chevron stitch with some simple flowers. Next up was the vertical seam on the left. I kept coming back to this one to add elements in order to give it more presence. In hindsight, I should have made the chevron stitches somewhat smaller. I think that "tightening" up the pattern would have made it read better. But adding little ribbon elements and filling in the pink flower heads with additional lazy daisies made a big difference for the better! The feather stitch to the right of it was added later. Doing the flowers all in one color bead made it very un-interesting. Changing them to two colors made all the difference! I love this curvy seam! The flower beads were a late addition to help balance the block with the others. 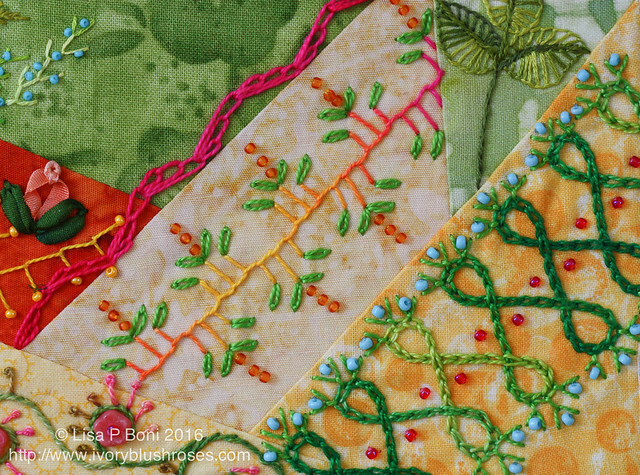 The fly stitch leaves on a curvy vine with bugle bead flowers is one of my favorite elements on this block. 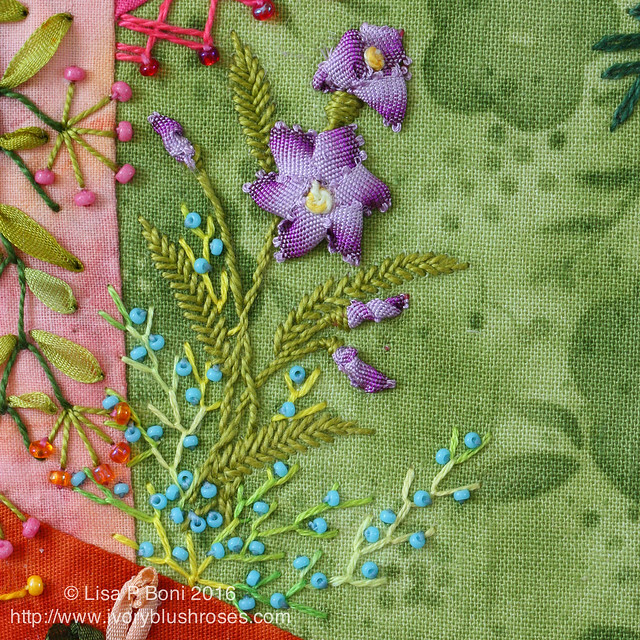 I just love stitching leafy motifs! There is very little buttonhole stitching on any of the blocks, so I added this simple but lovely seam! 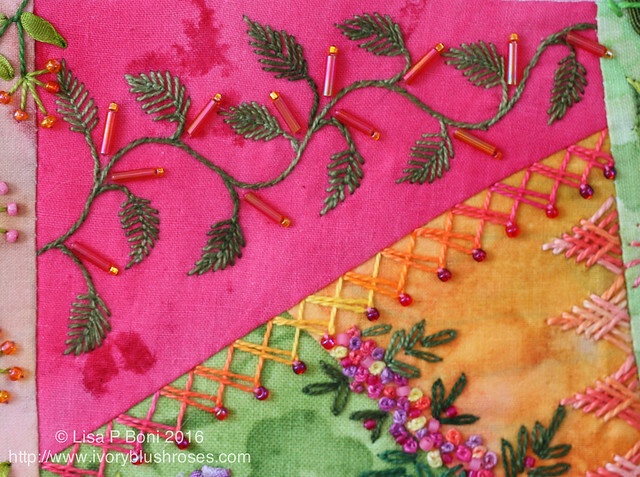 Below it, I added the chain-stitched seam to bring some color to this corner of the block. Above the buttonhole seam, there is a wave chain stitch seam that I found quite intriguing. I believe it came from Sharon Boggin's Tast stitches. Love how it changed a straight seam into a scalloped edge! 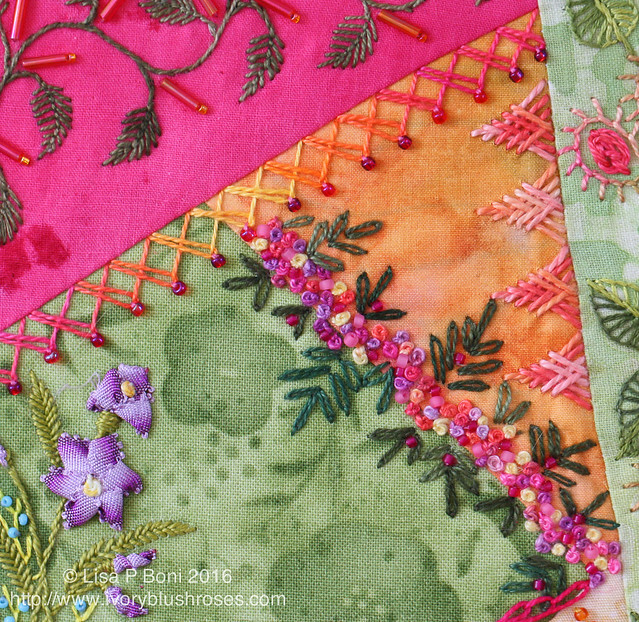 There were so many great variegated threads used on these blocks, mostly Caron Wildflowers. 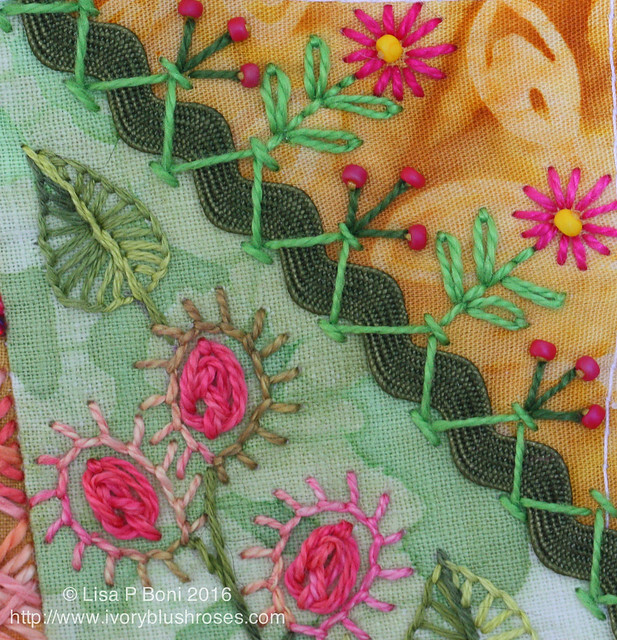 I love the pink/orange yellow thread used on the crossed lazy daisy seam along the lower edge of the pink patch. A fun and easy stitch to work. A stitch I discovered on an old crazy quilt was the woven arrowhead seam. That is stitched in size 5 DMC Variations. I rarely used size 5 thread on these blocks as it was simply too heavy, but the weight of it was perfect for this stitch! I think this is my favorite part of this block! For the central motif, I used a bit of woven picot edged ribbon from Mokuba and created flowers using instructions from a Japanese ribbon embroidery book that I have. It took a few tries to get it right, since I don't read Japanese and there were only photos to go by! 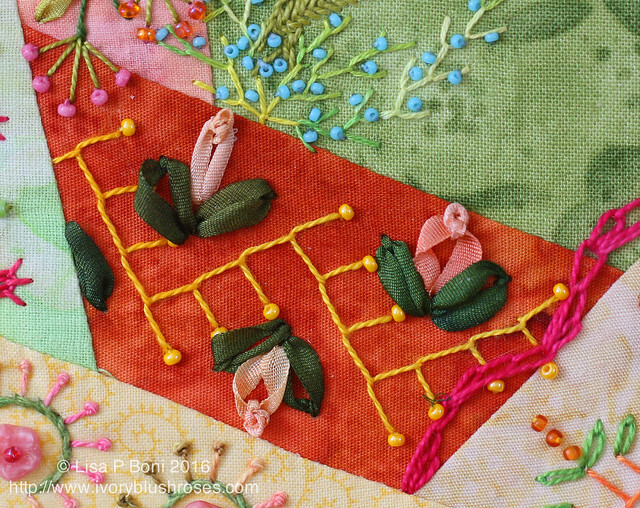 Another stitch copied from a vintage quilt was this simple stepped feather stitch seam. The last motif to be stitched was tho one that I had sketched from somewhere into my stitch book. The leaves and stems were embroidered with DMC variations embroidery floss I believe. The flowers are a mix of Colour Compliments and a variegated pearl cotton that I found in a multi spool pack of pearl cotton at JoAnn Fabrics. So happy with the way it turned out! Here are all the blocks laid out on my dining room table. I plan on putting some sashing between the blocks so that each block is framed individually. Can't wait to see it fully finished! So close! 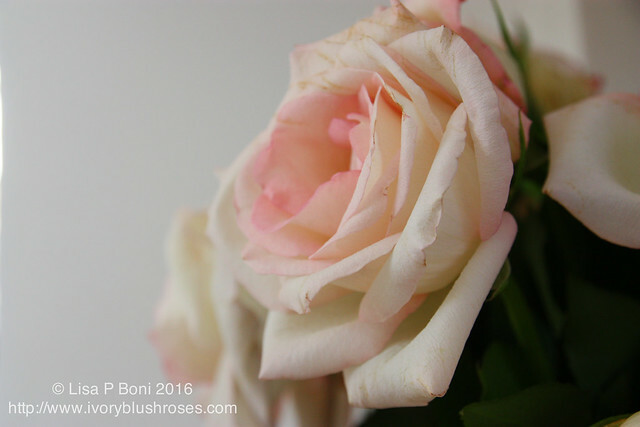 Last week I bought a bouquet of the prettiest "ivory blush" roses! No scent, but so lovely. Now they are softly fading into antiquity. Outside spring has been coming on strong! 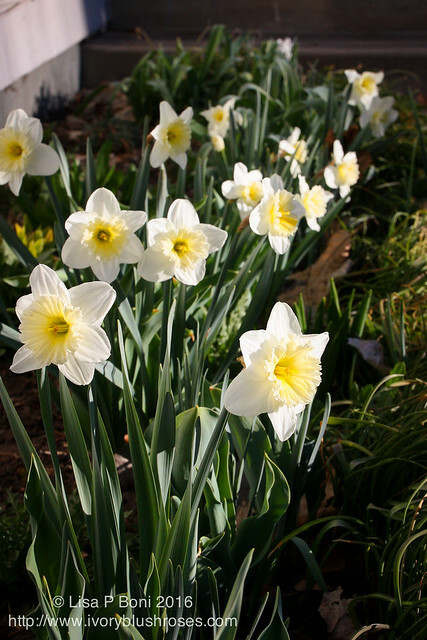 Along the front walk, the daffodils are blooming gloriously! 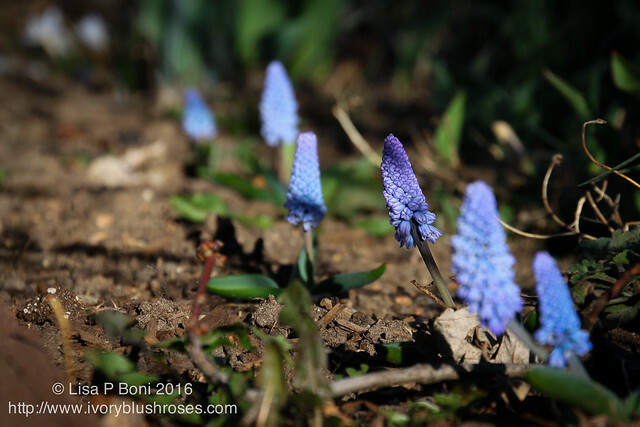 Along the driveway, the grape hyacinths are blooming beautifully! In the early morning sun, that lavender blue just glowed! So gorgeous! Now that everything is blooming, we have a forecast calling for 4 to 8 inches snow or more for tomorrow night. Sigh. It will be good to slow things down a bit as everything is blooming 1 to 2 months early and the moisture is greatly needed! But such a harsh blow after weeks of lovely warm spring weather! Congratulations!!! This project is absolutely amazing. I so much love the colours you have used throughout. So nice to see such pretty flowers in bloom - nowhere close to that here yet. Lisa, your work is astonishingly precise and very, very beautiful. Absolutely Lovely. This color range is way out of my comfort zone, but you have made it so beautiful. Teaches me to reach out and experiment with other colors. Lovely Job!! Wow Lisa - what a journey. To see all of the blocks is amazing and so beautiful. Thank you so much for sharing this with us. You are so inspiring and I look forward to stitching like this someday. I have so enjoyed each of your blocks! The colors are beautiful and I have poured over the closeup photos of your stitches. Just love the combination of your embroidery stitches---you did such a wonderful job of choosing the right threads, beads etc. I'm a fan! 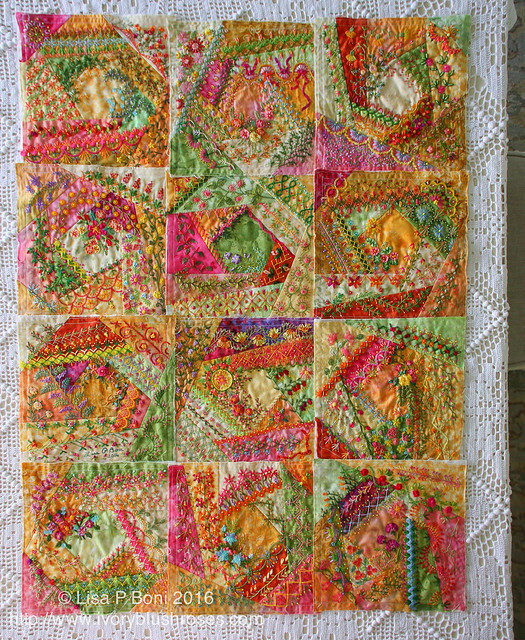 Congratulations dear Lisa on finishing this series of blocks which are exquisitely done. I look forward to seeing the finished piece. Your work always amazes and inspires me. Thank you. Your spring blooms and bouquet of 'Ivory Blush' roses are so pretty. Your work is nothing but breathtaking. Thank you for sharing! Wow! Your work is wonderful! 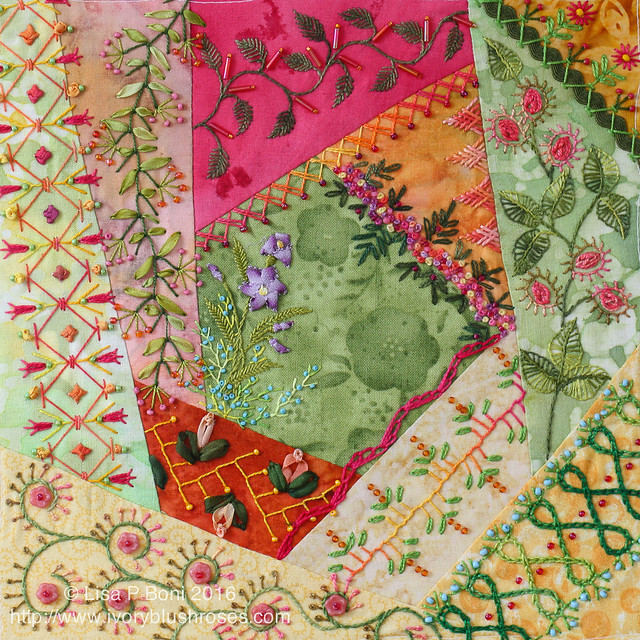 I'm just starting on my crazy quilt journey and pieces like this give me so much inspiration! ( And something to aspire too!) Will Keep reading your blog! Thanks for posting! If I listed each element that attracts me, I'd list everything. I especially like your curvy seam and the way you created a triangular shape with it. Congratulations on a gorgeous finish. Absolutely beautiful!!! When I grow up (I'm 51 at the moment), I want to stitch like you! Thanks for the inspiration each time you pick up a needle and then share your results. I just wanted to say how much I have enjoyed watching you stitch this project. I love your style and the colors are beautiful. Thank you for sharing.